Once free of the confines of that United Airlines 737-900ER from San Diego (and an extra scuffle of my feet to rid them of any remaining orange cheesy crackers), I wasted no time in exiting the terminal to catch the train over to T5. Above-ground inter-airport trains such as the one at ORD are never a dull experience, and I was very much looking forward to zipping around the field with my nose pressed to the window the entire way and getting reacquainted with my old friend that is O’Hare. Some things just aren’t meant to be however, so imagine the shock and horror I felt to see that train sitting idle at the station looking as if it hadn’t moved in days, complete with a blocked off entrance and crudely built signs directing passengers to use temporary busses instead (with arrows pointing vaguely in the direction of oncoming traffic). Poop. Busses are never as much fun as trains. Turkish Airlines 777-3F2ER side view illustration by norebbo.com. I know that’s not a devil’s fork on the rear section of the fuselage (or is it? ), but it’s a really neat design element and gives this livery a unique look. 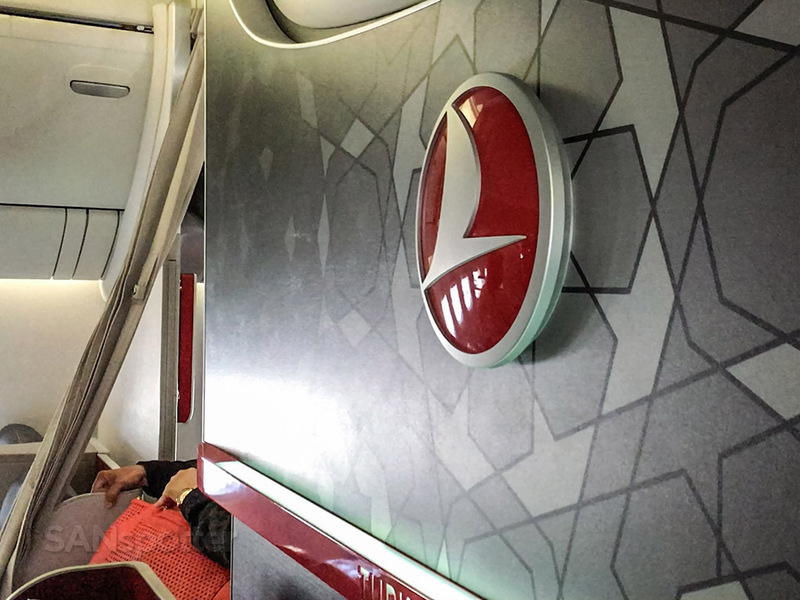 Seat map of this Turkish Airlines 777-300ER (courtesy of seatguru.com) showing my seat (40A) for this flight to IST. 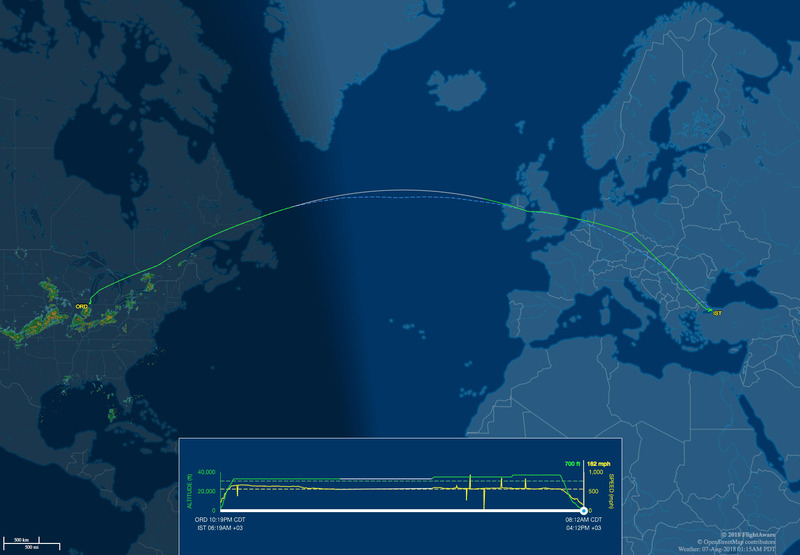 Our route from ORD to IST tonight. Looks like we got out of town just in time before the storms hit! 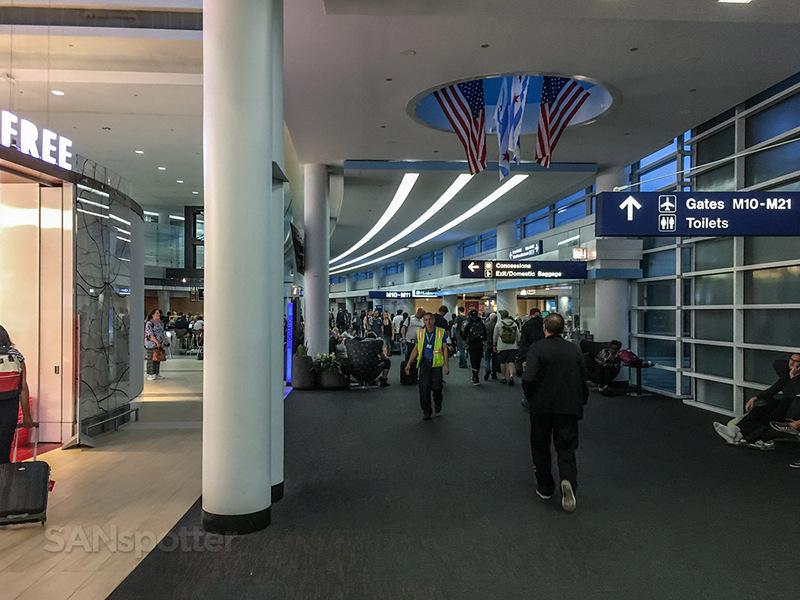 It had been 16 years since I last set foot in the international terminal here at ORD, and the most trippy thing about it was the fact that it looked exactly the same as I remembered – right down to the flags hanging from the high ceiling and vanilla white prison-like walls in every direction. 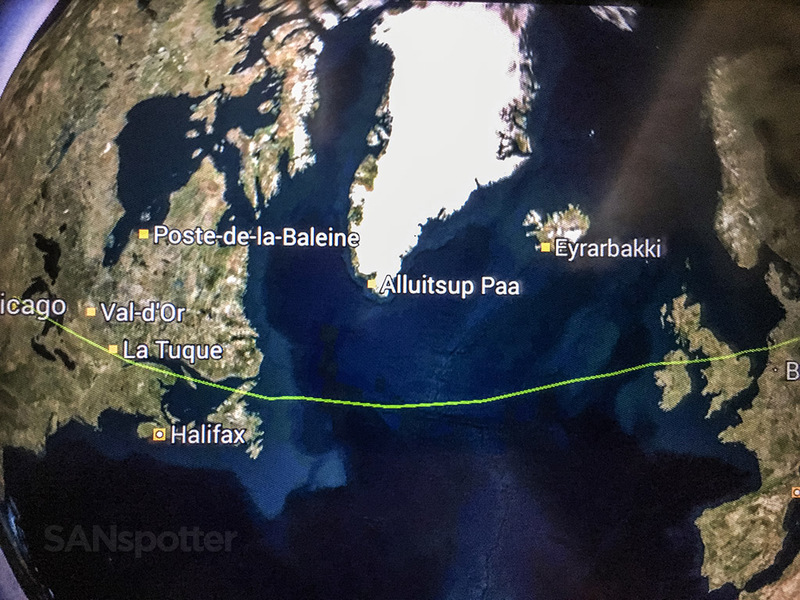 It’s like time had been completely frozen for the past 16 years, and memories of being just a kid and being sent on a business trip to Milan on an Alitalia MD-11C came over me in a rush – though it was somewhat bittersweet since I wouldn’t be flying in business class this time. 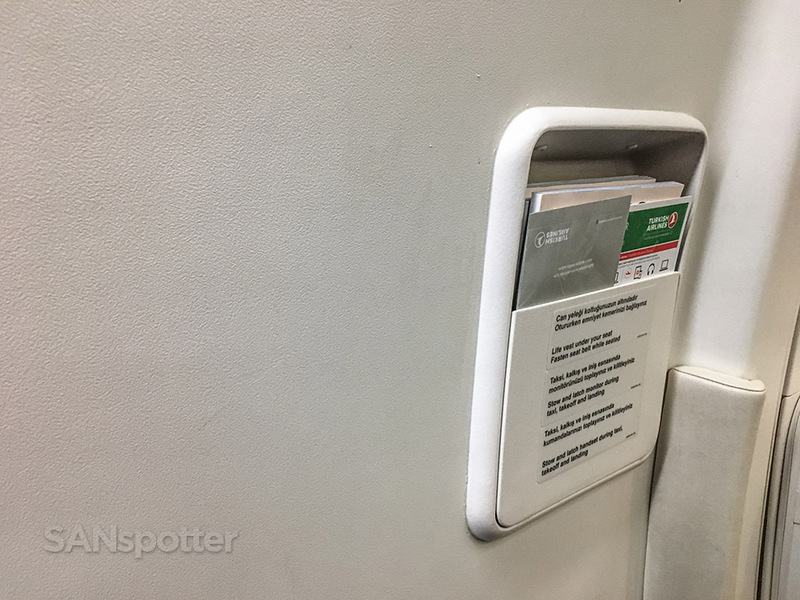 Not that 2002-era Alitalia Magnifica class is anything to be nostalgic about, but it’s the principle of the matter. Wait a sec. Am I here for jury duty or a flight to Turkey? Sorry O’Hare, but your international terminal looks like a government office building and it instinctively gives me urges to stand in lines while filling out forms. One thing I didn’t recall from all those years ago was the struggle of trying to get through security. The line seemed short when I first approached it, but once turning the corner and seeing what looked like a massive knot of frustrated looking people, I woefully accepted the fact that it was going to take at least an hour to untangle my way through it. Thankfully it kept moving at a decent pace, and I was able to reach the scanner within 35 minutes. 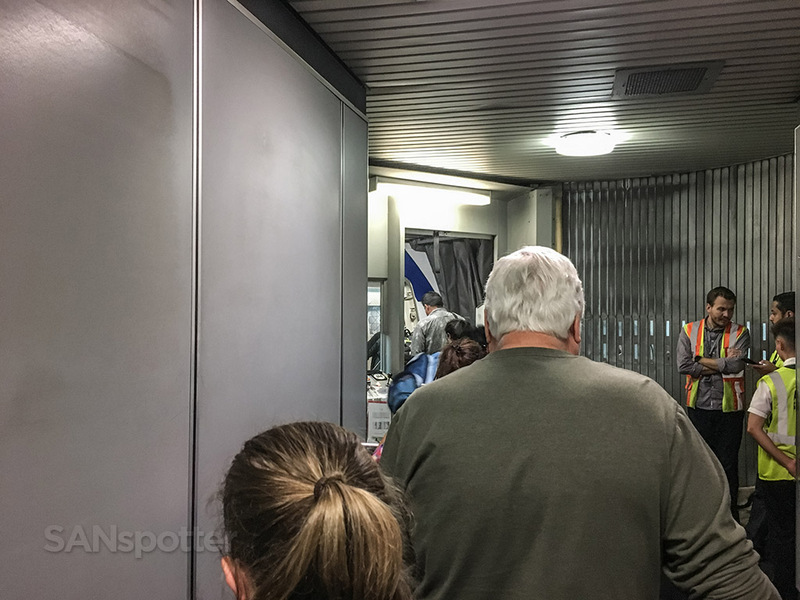 And then right before I put my stuff on the conveyor belt, two people pushed through from behind with a “sorry, I’m going to miss my flight, can I cut ahead?” plea. I politely let them by of course, but I’m fully of the opinion that people need to take more responsibility for their actions and accept the consequences. If you’re late, you’re late – don’t inconvenience others due to your lack of planning! I sound really salty don’t I? I know. My mood sours when denied rides on airport trains with awesome views. 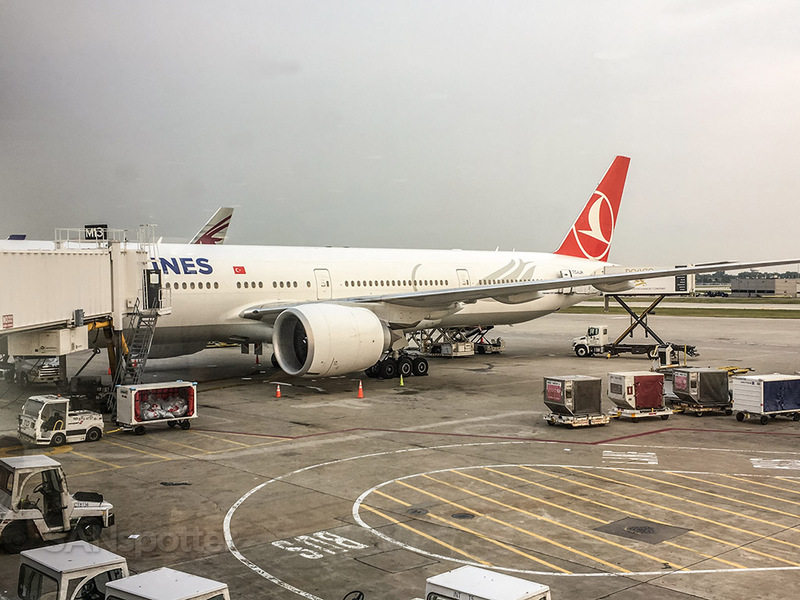 Good news though – there is nothing that will make a salty AvGeek happier than seeing his ride to Istanbul sitting there at the gate looking sharp and ready to fly. A subtle reminder that I was just a lowly economy class passenger tonight. It would have hurt a little less if the sign wasn’t so big. Priority numero uno after checking out the gate for my flight to Istanbul was to get some nutrients running through my veins, and even though I had access to both the Swiss and KLM lounges thanks to my Priority Pass membership, I chose to hold off on that a bit since I needed a real meal. 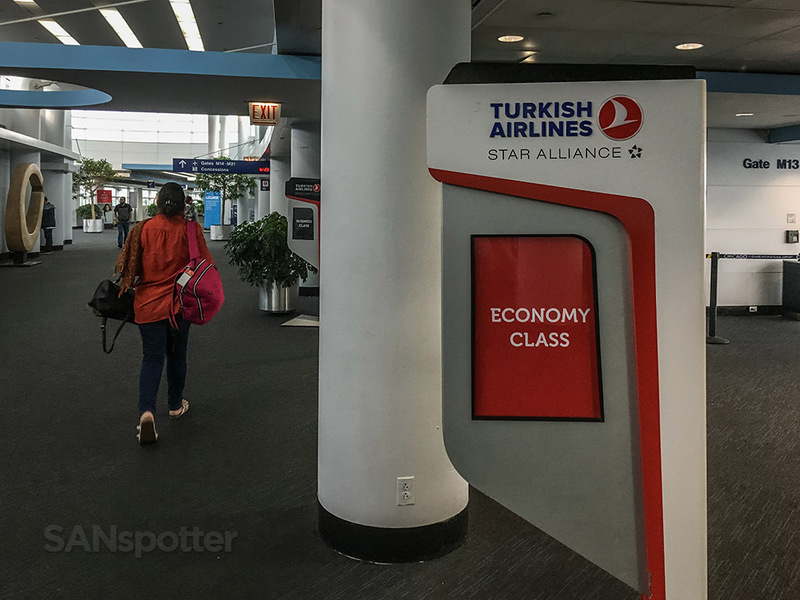 I assumed that neither of those lounges offer anything but light snacks, and besides – I was still feeling angst towards little orange cheese-flavored crackers and it was best not to be confronted with the likes of them again so soon. 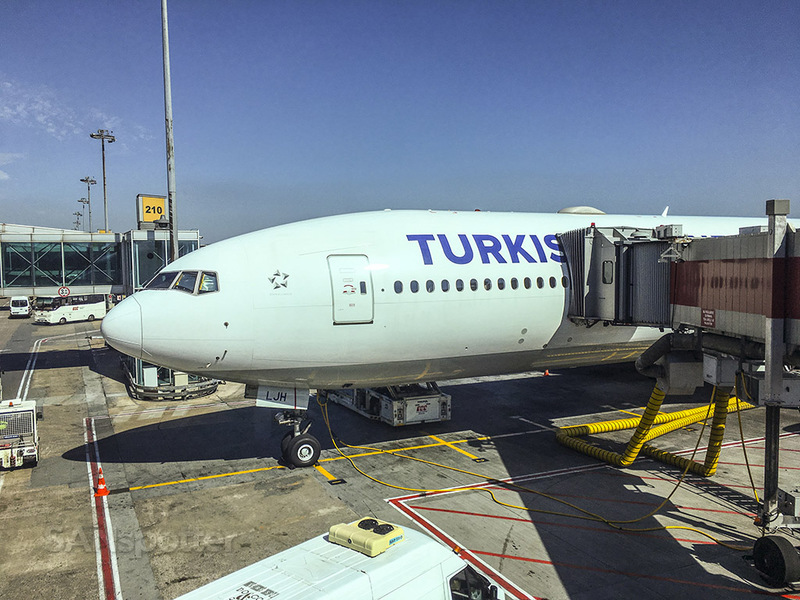 Up and down T5 I walked, scouting out the dining options and looking for a meal that would be satisfying yet light – after all, I’d be eating again in a few hours once onboard the flight to IST and I didn’t need anything that would sit like a granite rock in my gut. That was the plan anyway. 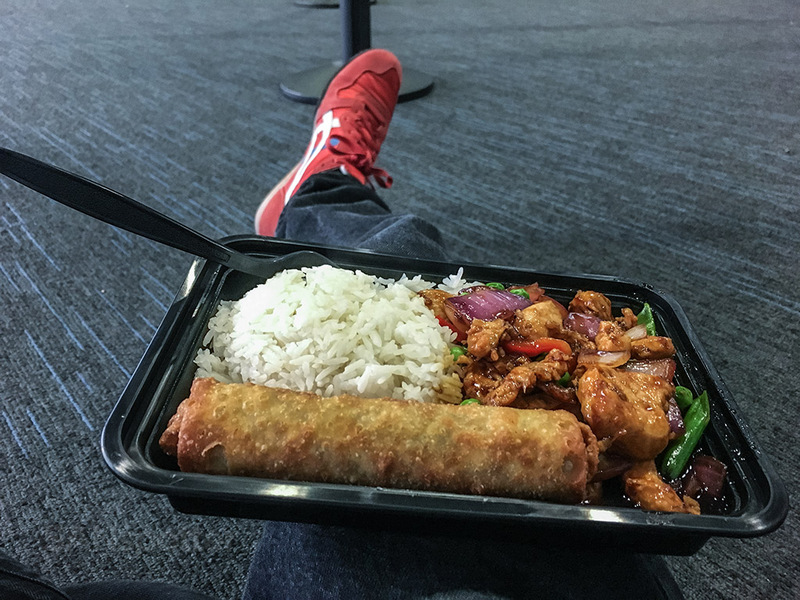 I happened upon a delicious-looking teriyaki chicken bowl in my search that was anything but light and feathery (especially with the monstrous egg roll I asked them to put on top) and as I sat there on the floor next to an electrical outlet stuffing it in my face, I couldn’t help but to think how unwise of a decision this was. It was tasty and highly satisfying though. So much for trying to find a light and healthy preflight meal. The egg roll was completely unnecessary, though it added an immense amount of joy to this experience. 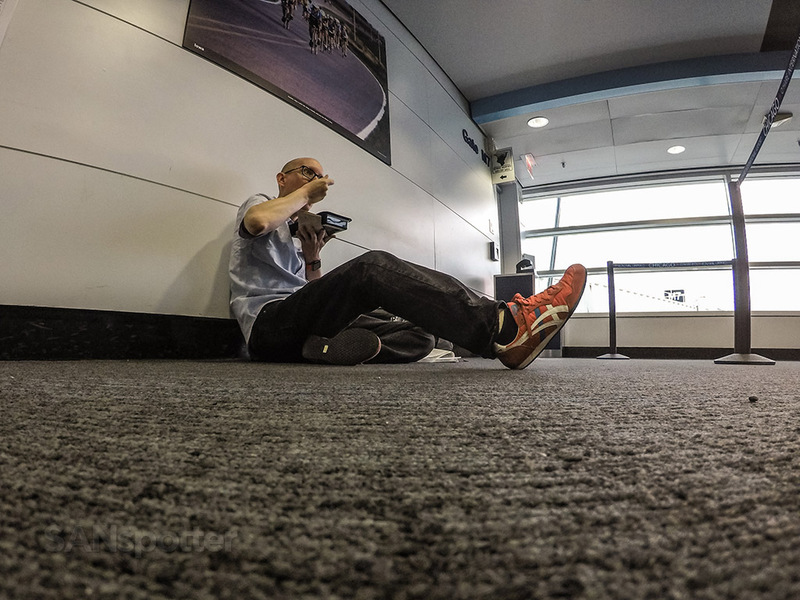 Remember the days before mobile phones when we didn’t have to scour the airport looking for electrical outlets? This was the best spot I could find to charge my phone while I shoveled dinner into my face. Two hours prior to boarding, I decided to whip out my Priority Pass card and give the KLM lounge a try. It ended up being a small but really nice hangout with some really awesome up close views to all of the action outside, and I realized that I was missing out big time by not going in earlier. I may be flying economy class tonight, but at least I have lounge access and I’ll be able to feel special (at least for a brief moment). Looks like there are some decent food options in here after all, so I totally wasted my money with that bucket of teriyaki chicken. Story of my life. 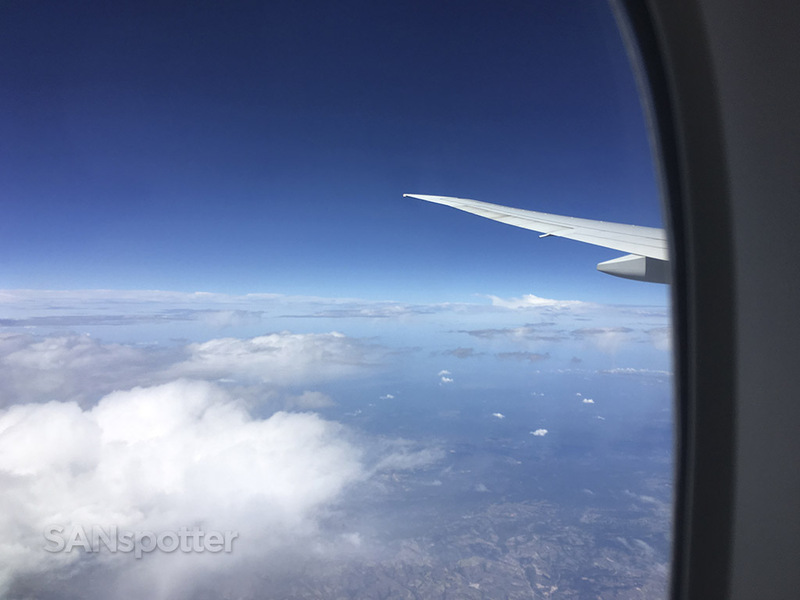 I found a good spot right at the tip of the nose of a Lufthansa 747-8, and soaked in the view while munching on a banana. 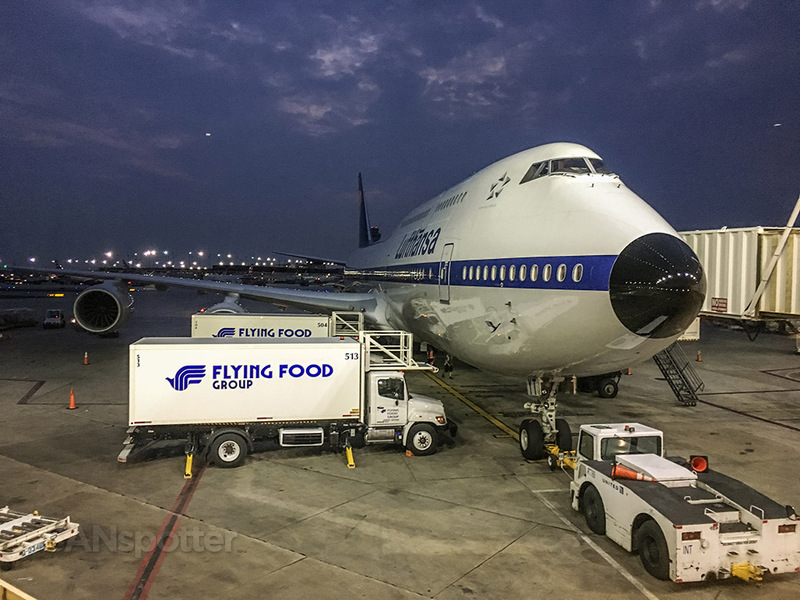 Some people like to hit the liquor before a flight, but give me a banana and a 747 and I’m good to go. Can you believe that I found an open seat right at the business end of this bad boy? I don’t even think that I blinked *once* the entire time that I sat here. Although a bit on the small side, the KLM lounge is pretty darn nice with amazing views to all the action outside. 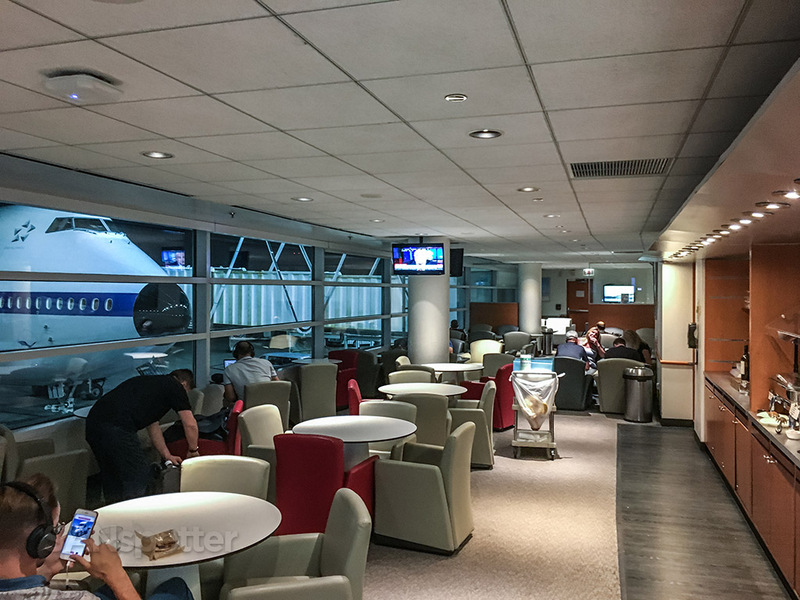 BTW, access to this lounge (and 1200 others around the world) is yours with a basic Priority Pass membership. 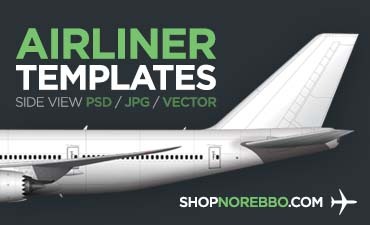 One heck of a good perk if you ask me, especially with 10% off deals going on at the moment. A brief demonstration as to why ORD is one of my favorite airports in all the world. Look at the diversity in that lineup! Quick! 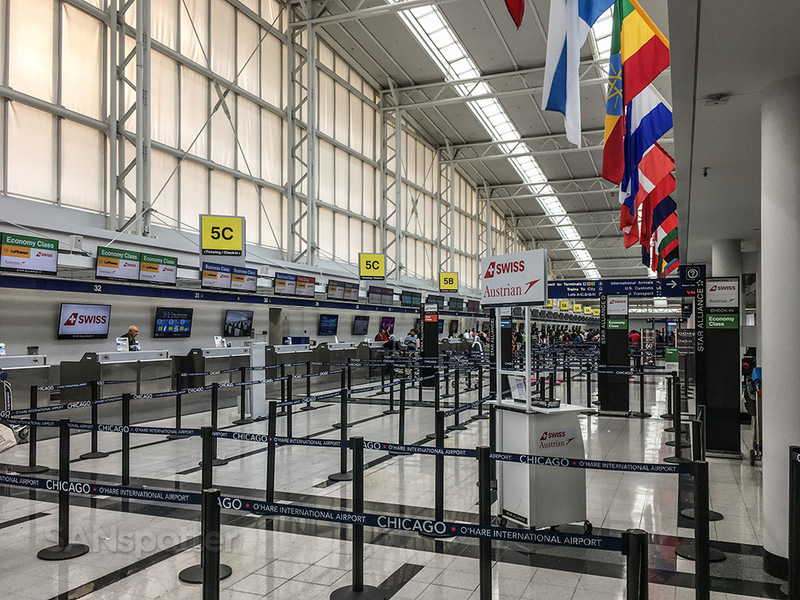 Without searching Google, how many other airports can you think of that has so many flags hanging from the ceiling? I’m thinking that somebody on the board of directors here at ORD has a flag fetish or something (not that there’s anything wrong with that). 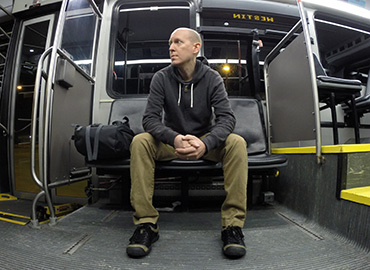 Boarding started about 20 minutes early for reasons I was never able to figure out, which caught me off guard since I hadn’t even stuffed my pockets with everything I’d need (earbuds, GoPro, snacks, etc). 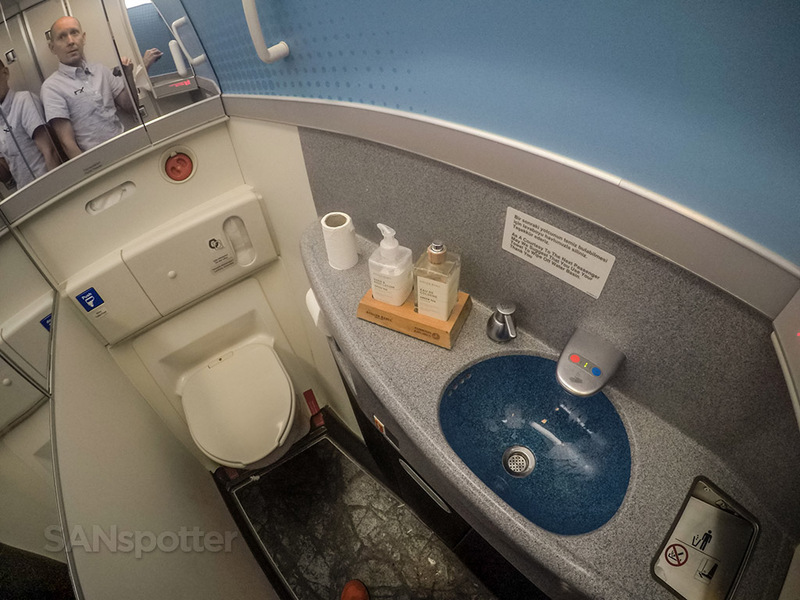 Heck, even the last-chance pre-boarding this-is-it bathroom trip hadn’t even happened yet. There are two things in life that I absolutely hate rushing through: meals, and bathroom breaks. Being forced to speed though either will only make me salty – and considering that I had already been denied a ride on the train and I was already reaching dangerous levels of saltiness tonight, it seemed things were stacking up against me. I can’t believe that I was stupid enough to take a picture of my open passport for this trip report. Hey – no peeking! “Hello security? 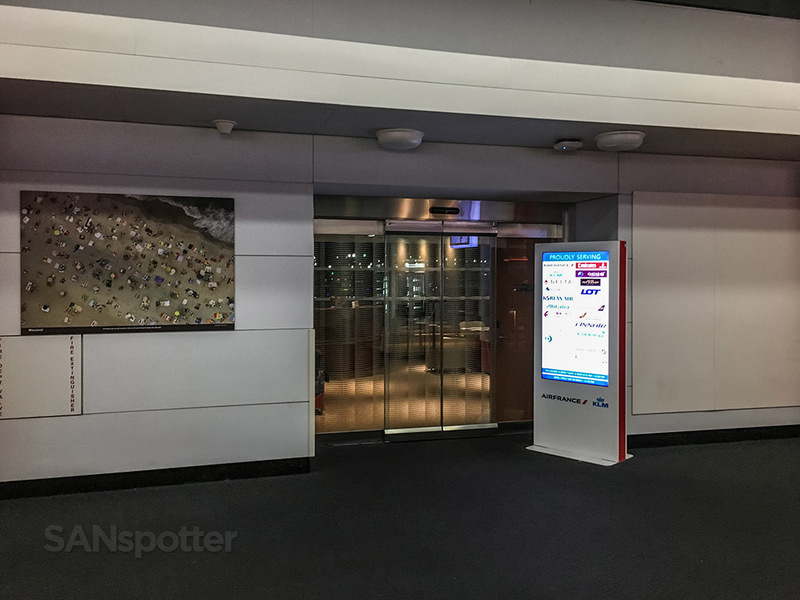 Yeah, there’s a creepy guy right behind me taking pics of *everything* and it’s SO weird!” Can you believe that I’ve never been escorted to a private room to be searched and beaten by armed security guards yet? Still taking pictures of *everything* since security hasn’t deemed me a threat (yet). Whoa! I wasn’t expecting such a colorful interior, but I’m really digging this. It reminds me a lot of Edelweiss! And there she is. Seat 40A with endless amounts of leg room. And horrifically, no window! You’re going to hear me grumble about the lack of a window in just a moment, but first I need to post this pic of the swag (blankets, headphones, and pillow) sitting ready and waiting on every seat. 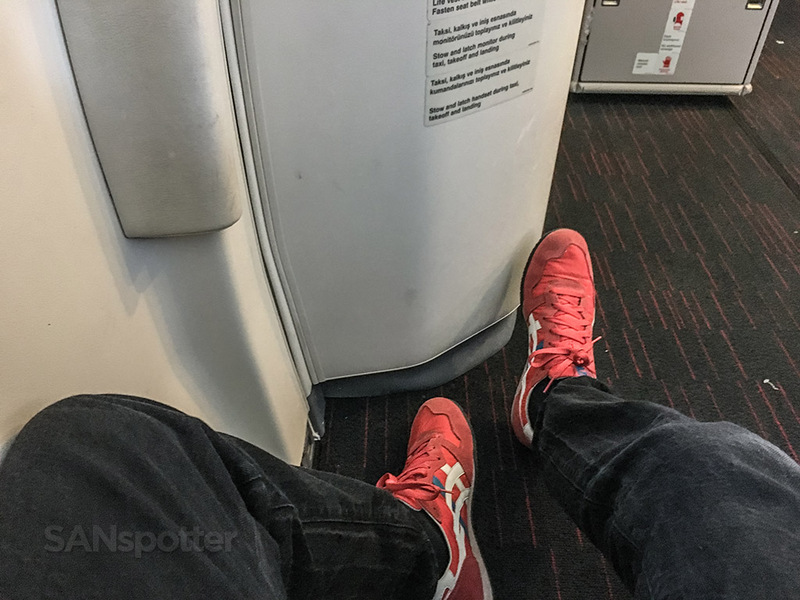 …that leg room though! It’s almost as if I could hear my feet (and knees) singing with glee. 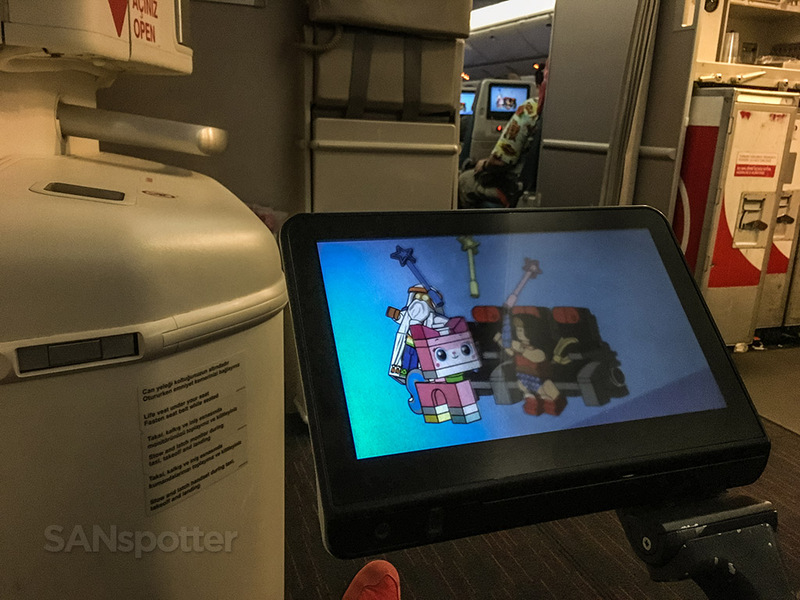 It took a few minutes for me to decide whether or not I liked the seat, and after having a look around at all the little details, I came to the conclusion that it was a pretty good choice for an overnight flight like this. Earplugs and an eye mask will solve the galley problem, and I’ll likely be sleeping anyway, so the lack of a window doesn’t really matter all that much. At least that’s what I hoped. No silly jokes about the safety card this time. Let’s be serious, people! 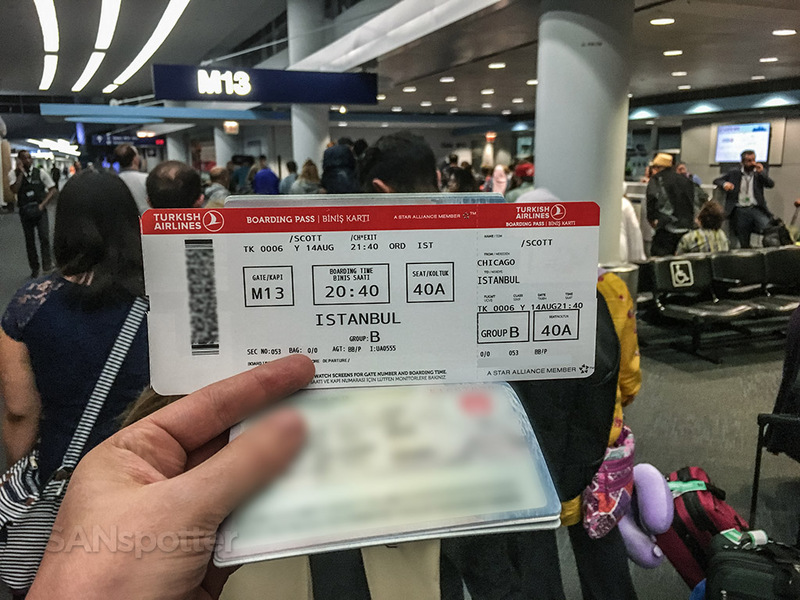 I am sitting in an exit row for tonight’s flight to Istanbul, and if we go down it’ll be my responsibility to get that big door open and to coordinate an organized evacuation. The truth is that I had put the card down after a few moments because I was feeling a panic attack coming on. I tried to study it like an adult though. I really did. The best way to fend off a panic attack? 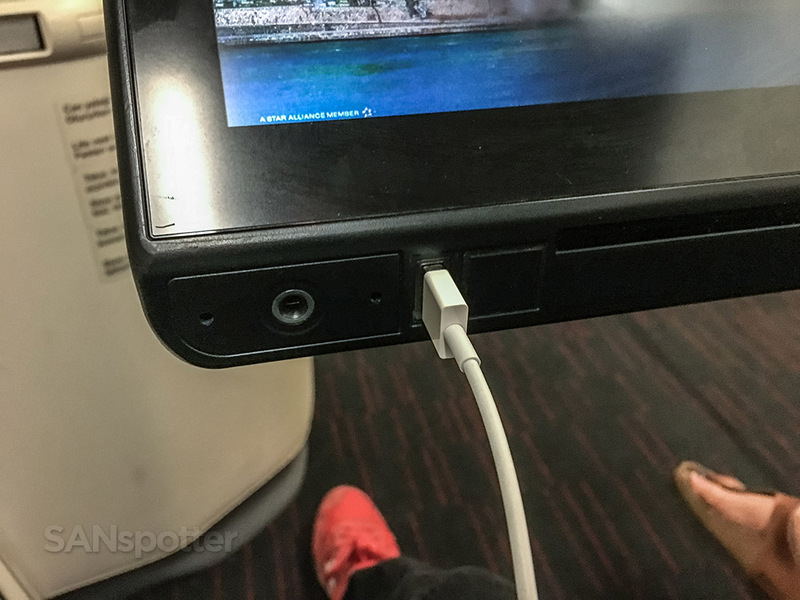 Knowing that I’ve got access to a life-giving USB port which will prevent my phone from dying a slow death over the next few hours. The cheapest and most toy-like headphones I’ve ever seen on an airplane. But at least they’re red! 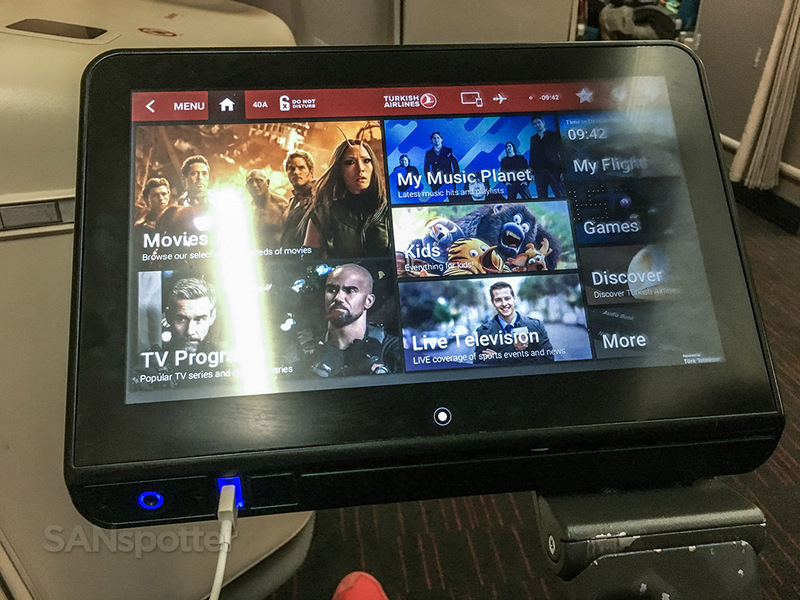 The entertainment system was fully operational while on the ground, so it was nice to get a preview of all the things that I wasn’t going to be watching while in flight. Hey – it’s been a long day so far and I was pretty sure that I was gonna be knocked out asleep for most of this journey. 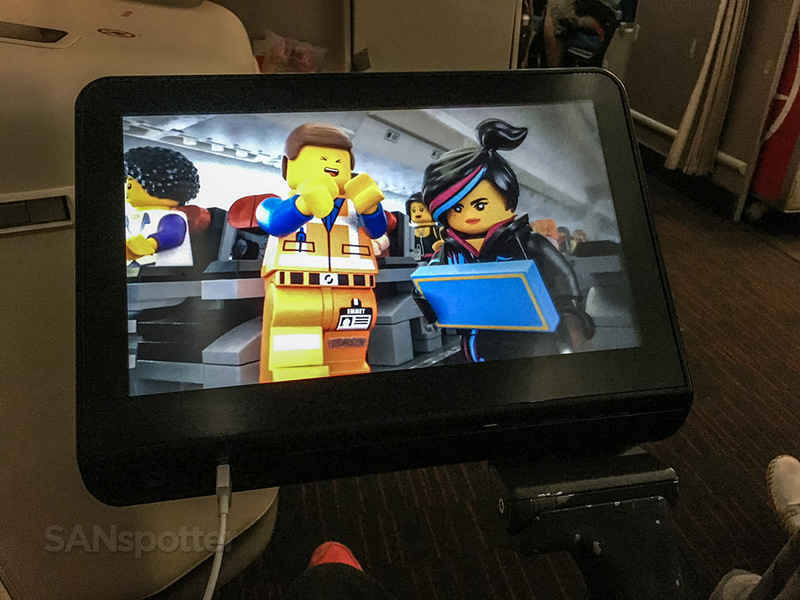 This amazing LEGO-themed safety video is all the reason you need to fly Turkish Airlines. So funny, so good, and I think I actually even learned a thing or two about airplane safety. Who created this anyway? Whoever they are, they deserve the greatest of awards. Do you have any idea how frustrating it is to want to be able to take pics of the departure sequence but not having the opportunity to do so? It was completely dark out there, and I didn’t have a window anyway, so this random picture taken at some point during taxi and takeoff represents the entirety of our departure out of ORD this evening. I figure that any pic with Wonder Woman, My Little Pony, and Obi Wan Kenobi in it is a fine substitute for takeoff pics – so here you go. 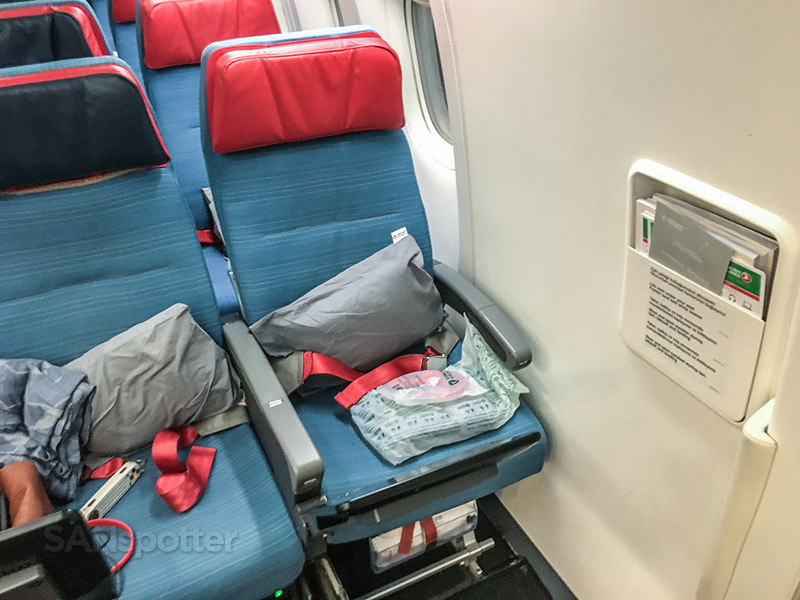 Service started with a bang on this flight, with the menus, amenity kits, and hot towels coming in rapid succession within 15 minutes of liftoff. 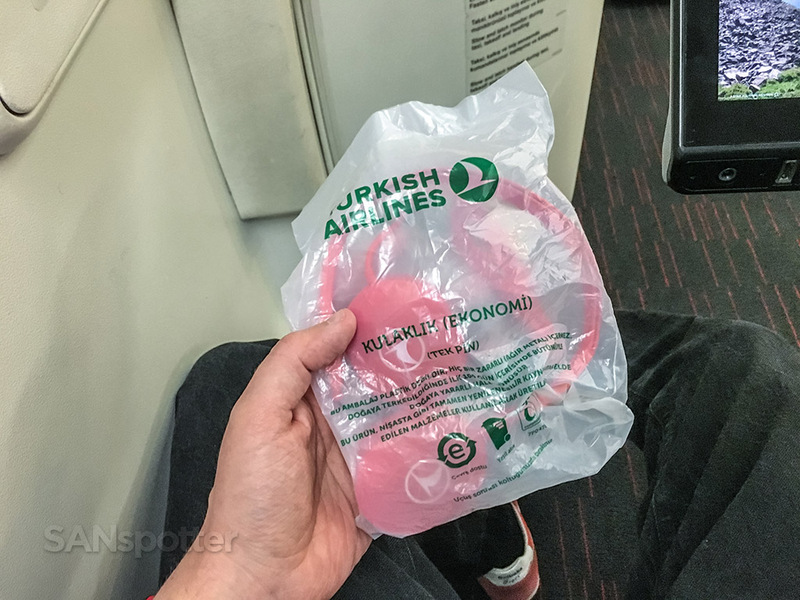 It still weirds me out to be handed an amenity kit in economy class. 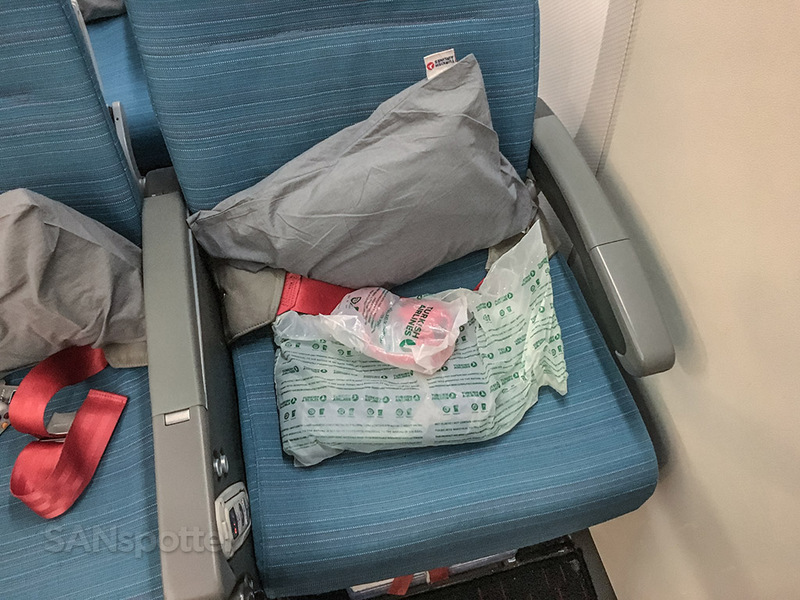 I remember my first international flight way back in 1997 (ATL-MAD on a DL L-1011) and all we got was a tiny meal and a blanket no thicker than a piece of paper. 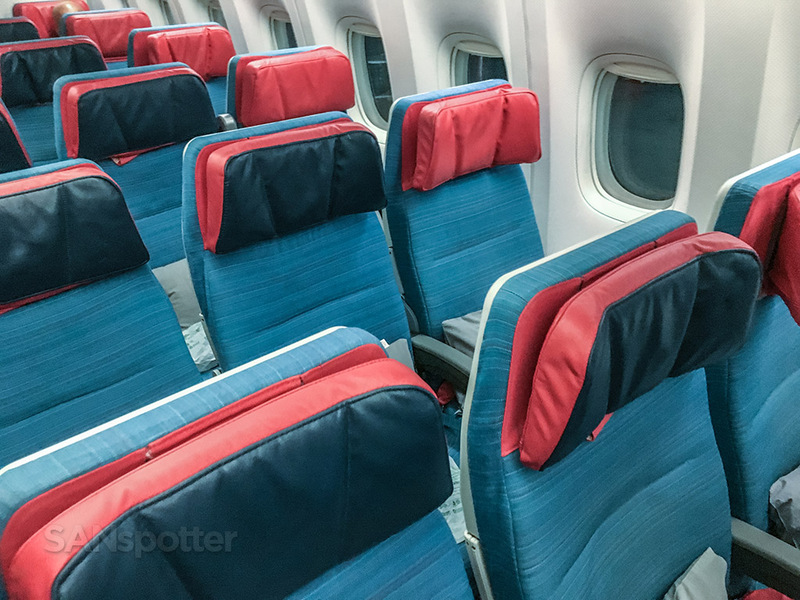 Economy class has come along way since then, and if I’m not careful, I might start really enjoying it. The horror! 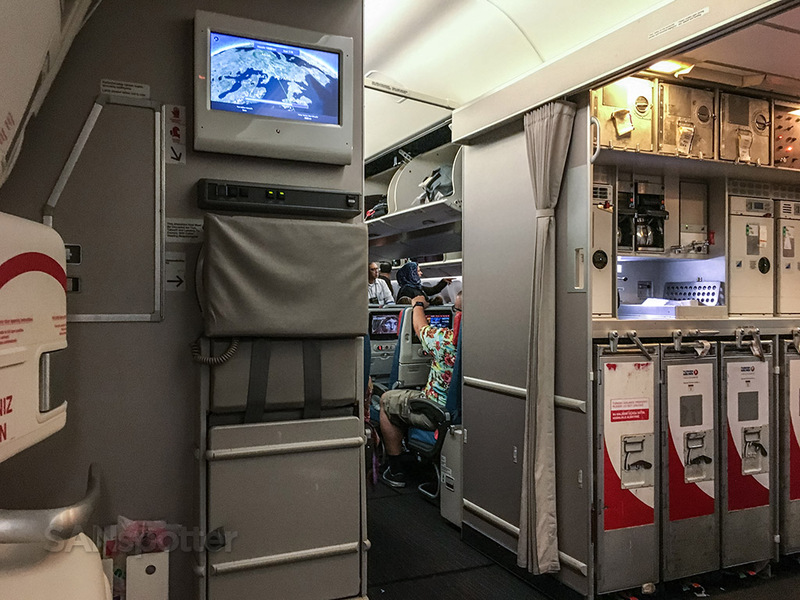 Unfortunately, the really speedy start of the cabin service set the completely wrong precedent for the remainder of the flight. From this point forward, things flowed slower than Molasses in an Alaskan deep freeze. 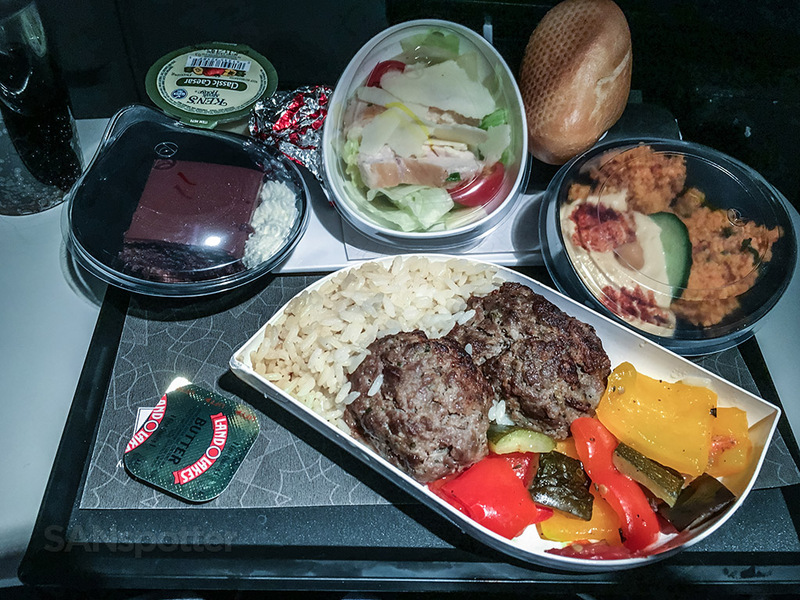 I should mention that slow doesn’t necessarily mean “bad” however, as I had no idea how delicious Turkish Airlines economy class meals are, and I was about to find out. Well, “about to” makes it seem like the meal came quickly, but the reality was anything but. You know how the Spanish are notorious for stretching out meals for hours and hours? I was beginning to think it’s the same way in Turkish culture. 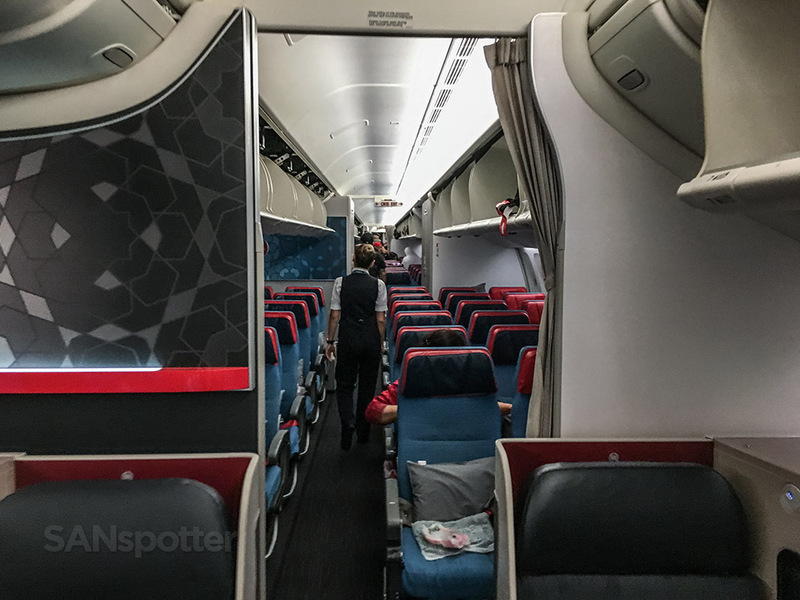 Row 40 (where I was seated) is the exact center of the economy class cabin on these Turkish Airlines 777-300s. 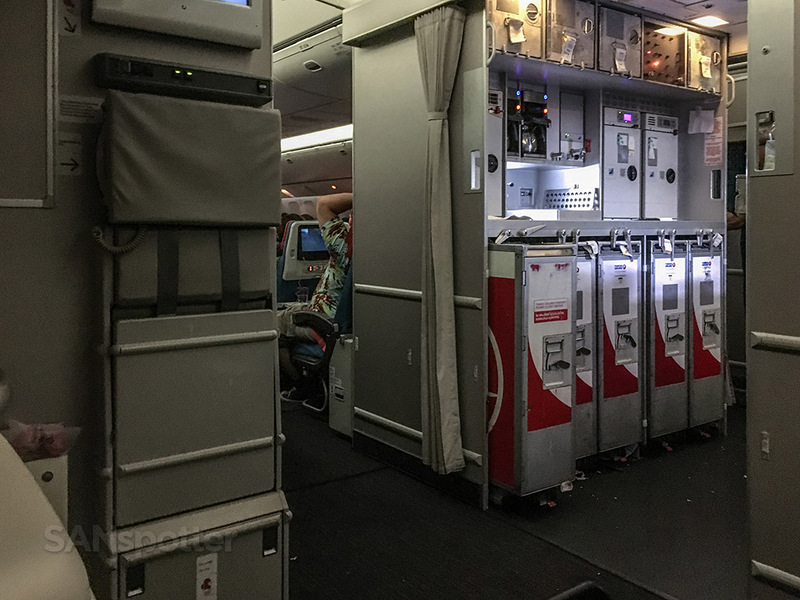 The flight attendants started at the very back and front of the cabin first, and then met in the middle (which just happened to be row 40). I don’t have a problem with this at all, as it’s only fair to those way in the back – but the speed at which they dolled out those meals was nothing short of glacial. It took an hour and a half for them to reach our row, which was frustrating at first, but kind of a good thing in the grand scheme of things. My gut was still working on that teriyaki chicken after all, so it’s not like I was sitting around feeling weak and on the brink of dying of hunger. At first I was bummed that they didn’t have my primary choice (salmon) but this beef platter was phenomenal by economy class standards. Once again, I was torn with emotion as I sat there eating. On one hand, part of me felt like I was getting salty again due to how long it took to be served, but it tasted so good that it was impossible to feel anything but pure satisfaction with every bite. I hate the feeling of wanting to be mad but not being able to feel anything but happy thoughts! The completion of the meal service was just like the beginning (but obviously in reverse). Everyone had to wait for over an hour for their trays to be cleared, which is never a good thing because it gives us all far too much time to think about how much we over -indulge and that we need to cool it or we’re going to end up in the Guinness Book of World Records for “world’s fattest and most disgusting human” or something. At least that’s what I was thinking. Patiently waiting for the flight attendants to come by and pick up our empty meal trays. 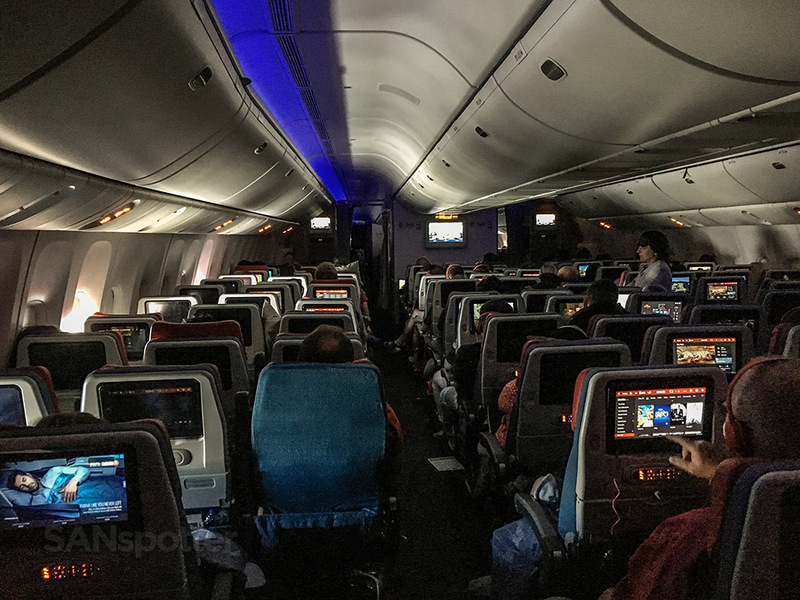 And yes, that light is coming from an open window on the other side of the cabin, indicating that the sun has already risen over the horizon (which didn’t help to make the slow service seem any faster). At this point I was doubting whether or not they would pick up our dinner trays before we reached the shores of Ireland. You probably think I’m joking, but seriously – the sun was already coming up for crying out loud! 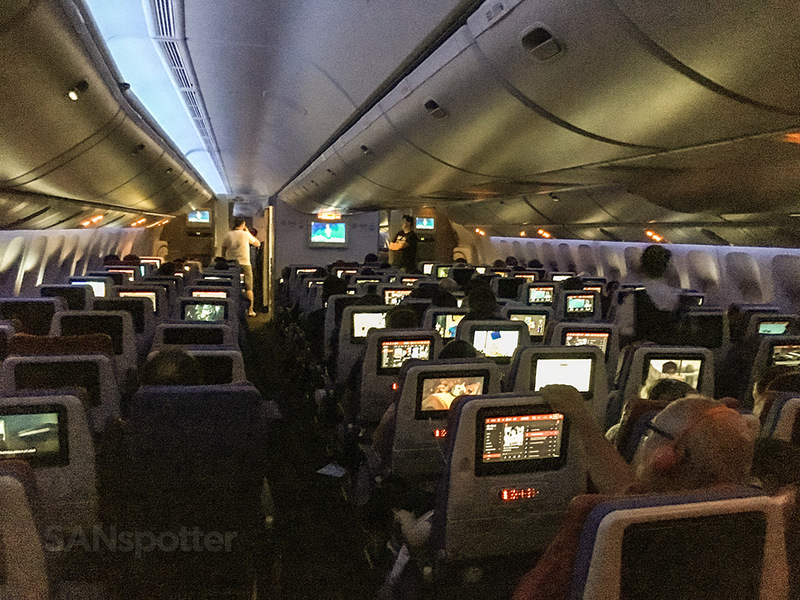 Several hours of some of the best economy class sleep that I’ve ever had followed the meal service, which wasn’t surprising considering how busy my day had been up until this point (and the fact that I wasn’t bunched up in a ball in a typical economy class seat). I got up every now and then to stretch and use the bathroom, and all in all it was a really nice evening/morning there in 40A. Check out my “sophisticated traveler” pose in the mirror. I’ll be fending off calls from GQ once this post goes live, I just know it. 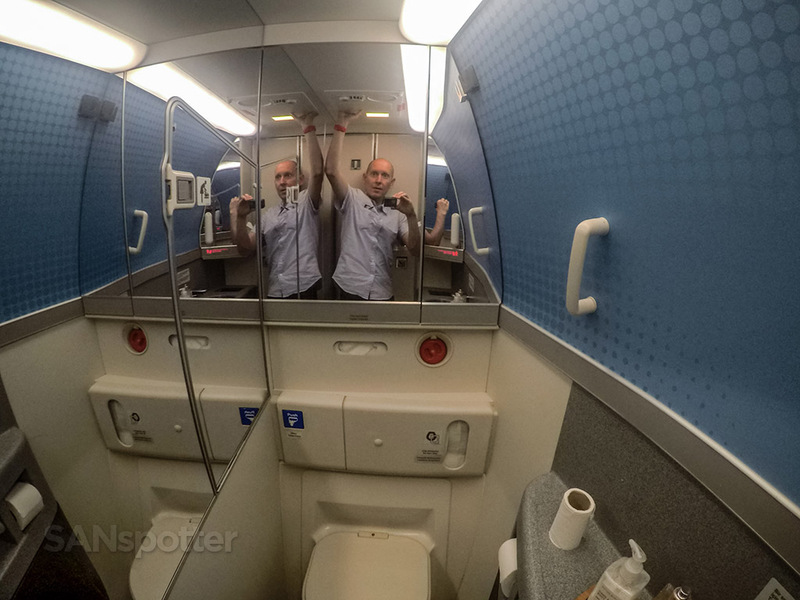 Your’s truly giving a very odd demonstration of how large this lavatory is. The **** am I doing? I honestly can’t remember, but knowing me, I must’ve had a really funny idea at the time that I was sure would be a hit on the blog. It’s only funny if I can remember what I was thinking. Too bad YouTube wasn’t an option on the entertainment system, because it might have been fun to tap people on the shoulder and tell them about “a really cool channel I heard about a guy who calls himself SANspotter”. 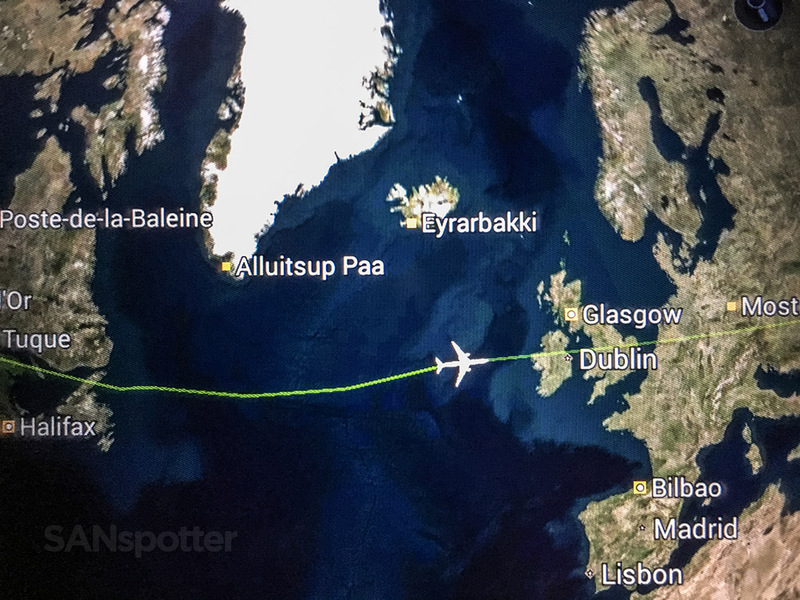 Quickly approaching Ireland, and I’m happy to report that yes – they did eventually pick up our dinner trays a few hours ago. 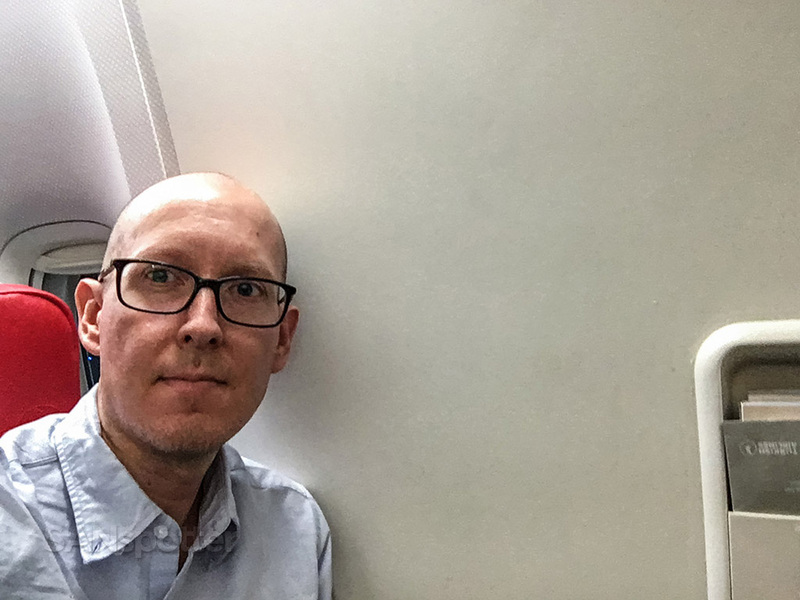 Being able to get up and walk around whenever I felt like it was one of the best things about having the exit row seat. 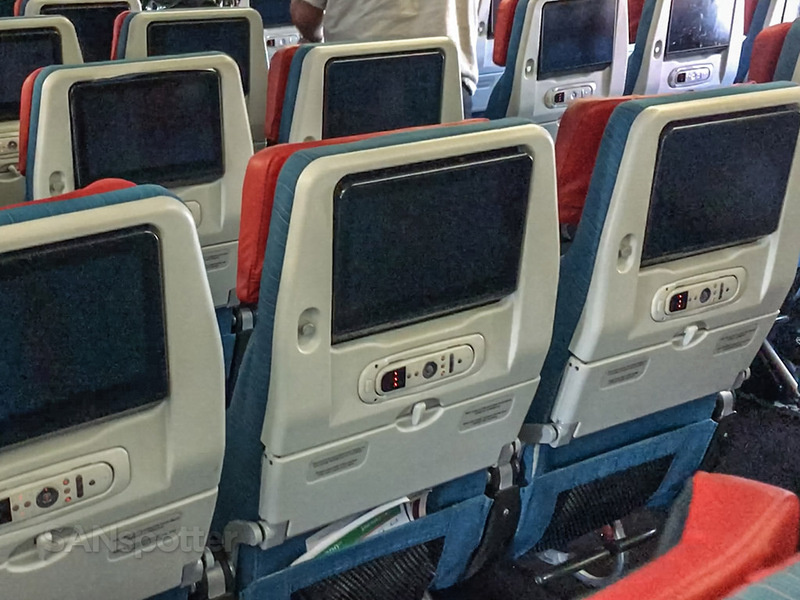 Those knees and feet were still belting out songs of glee, and after putting up with that racket for a 6 hours, the saltiness I had earlier in the flight had been completely wiped away. 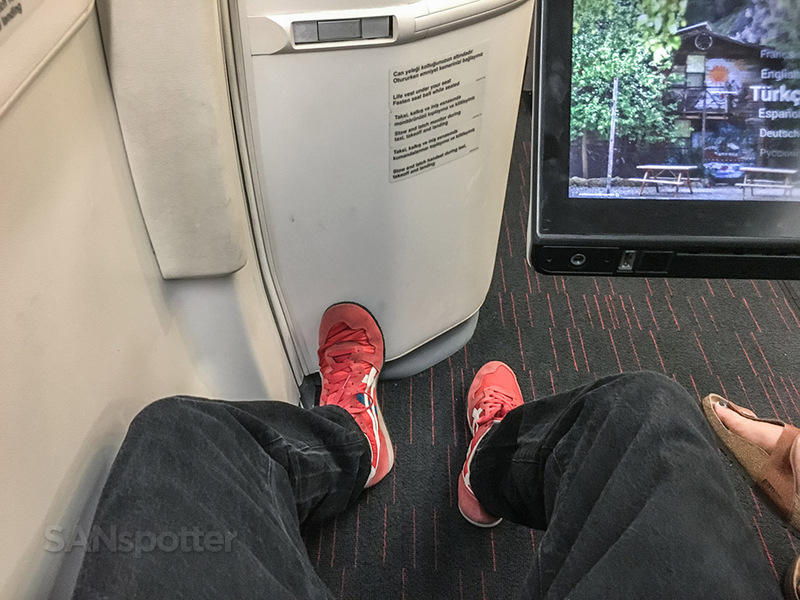 It just isn’t possible to be grumpy when your knees and feet are having the economy class flight of their life. 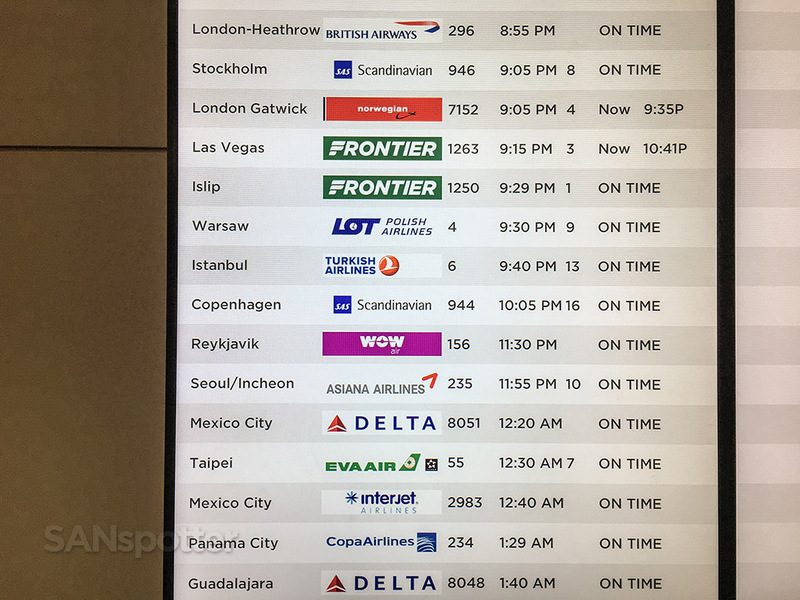 The lights came on with only an hour and 45 minutes of flying time remaining, and I thought for sure they were going to have to pull off a miracle in order to get breakfast served in time. Just as they did with the dinner service several hours prior, they started at the front and rear and met simultaneously at row 40. 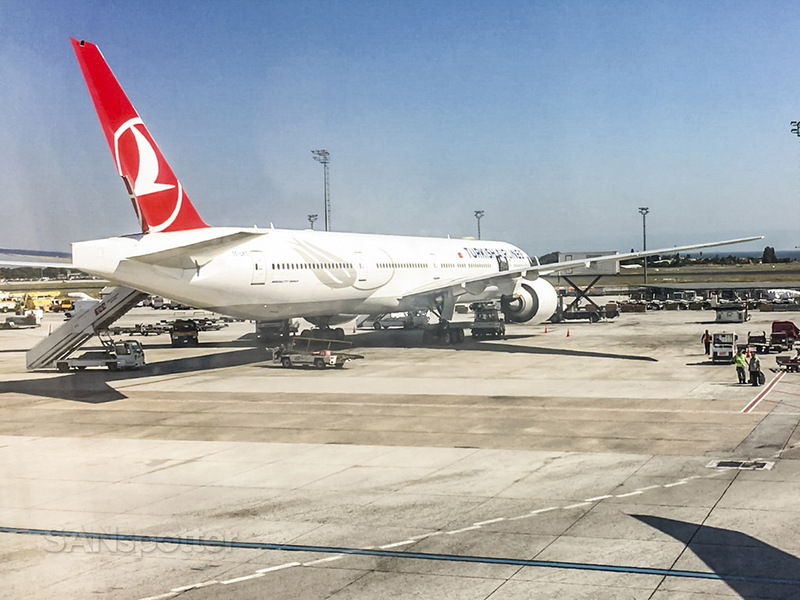 Thankfully they were a bit faster this time and I had my breakfast in front of me with just one hour before touching down in Istanbul. 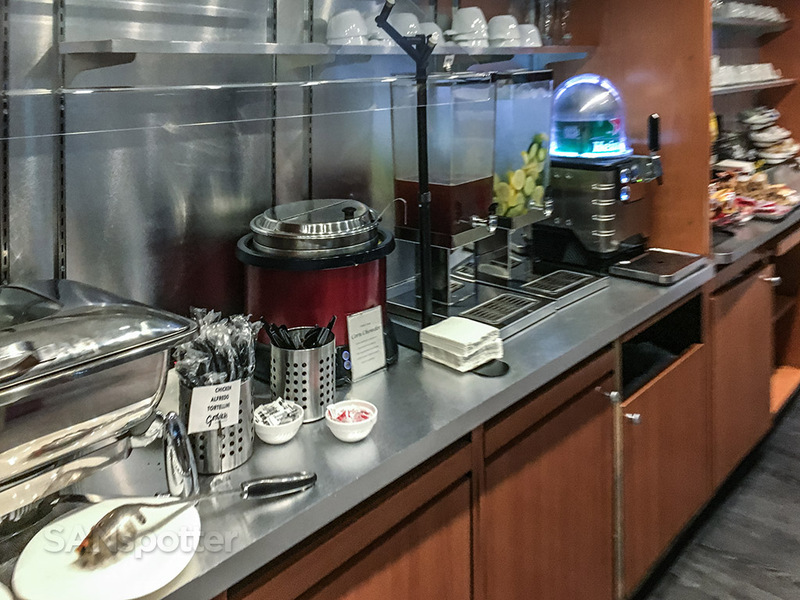 After sitting there in my seat smelling some amazing things coming from the galley just a few feet away, I was very much looking forward to diving in to this steaming hot plate of eggs. Unfortunately, it was as cold as being just pulled out of the refrigerator – what the heck were they cooking for the past hour and a half? I can’t even see the plane anymore, so I guess that means were getting close to Turkey! At least I hope that’s what that means, because as you may recall, I didn’t study that safety card as well as I should have, and I still have no idea how to open that big door next to me in the event of an emergency. 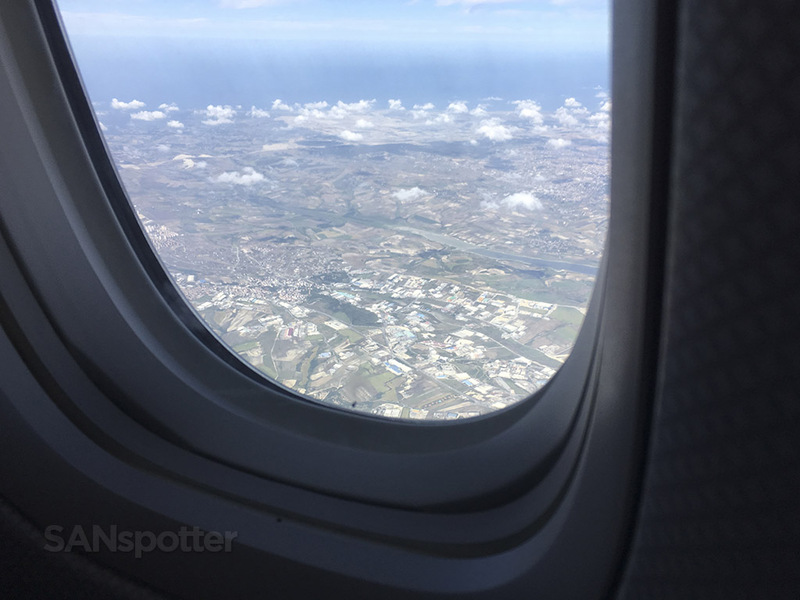 Thankfully the person sitting behind me raised her window shade after breakfast and I was able to twist my head and arms back in order to get some proper AvGeekery pics. “Ok, you guys can shut up now. We’re almost there and you don’t have to keep reminding me how happy you are!” Nothing defines “delirious” better than someone who has conversations with his singing feet and knees. 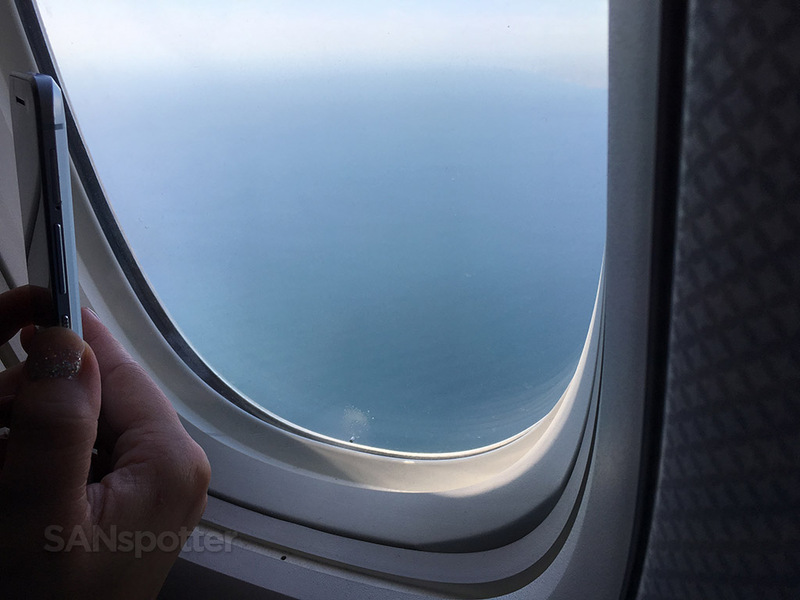 The weather was absolutely phenomenal out there on our approach into IST, and for the first time of the entire flight I was feeling a bit frustrated with my window situation. Yeah, I could kind of see what was happening if I cocked my head all the way to the left (almost completely around like an owl), and as I was trying to wedge my camera in there to get pics and video of the approach, it dawned on me that I was probably annoying the hell out of the woman behind me. She never once blurted out an expletive at me to quit blocking her view, which is a good thing – otherwise, the next few pics may have never happened. 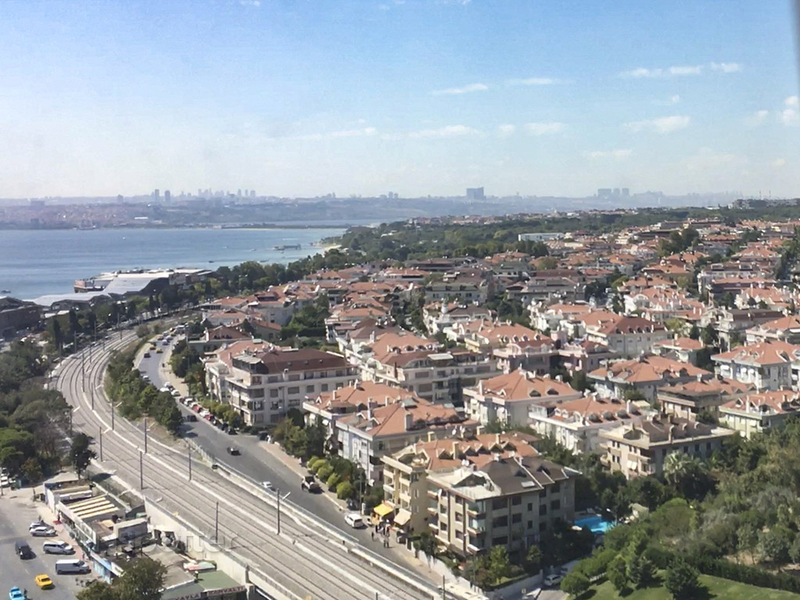 Getting my first ever views of the country of Turkey now, along with a twinge of regret that I wouldn’t be staying. Oh well – it’s on my list! Wow, that looks really nice. I neither deny or admit that I was hoping for a cancelled flight to Vienna which would require me to overnight here. OK, that’s it. Turkey is now in the top five of my “places I wanna visit” list. That looks amazing! 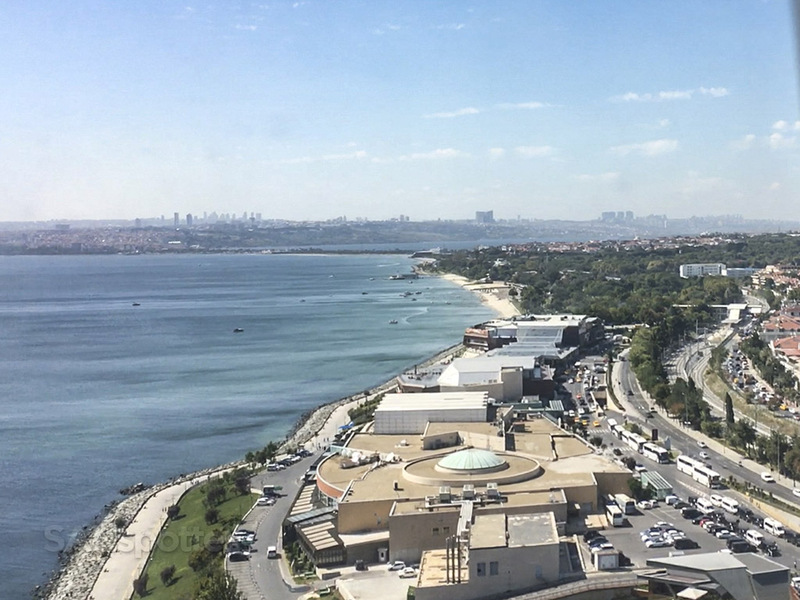 Welcome to Istanbul! 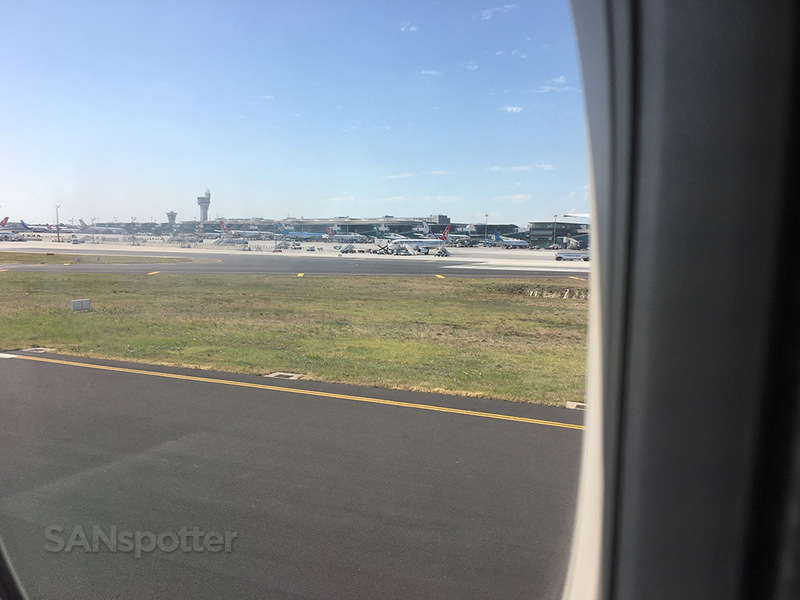 Low quality pics such as aren’t going to win me any travel photography awards, but considering how twisted around I was and how hard the plane bounced when it hit the runway, I’m quite satisfied with this result. Damn I’m good. 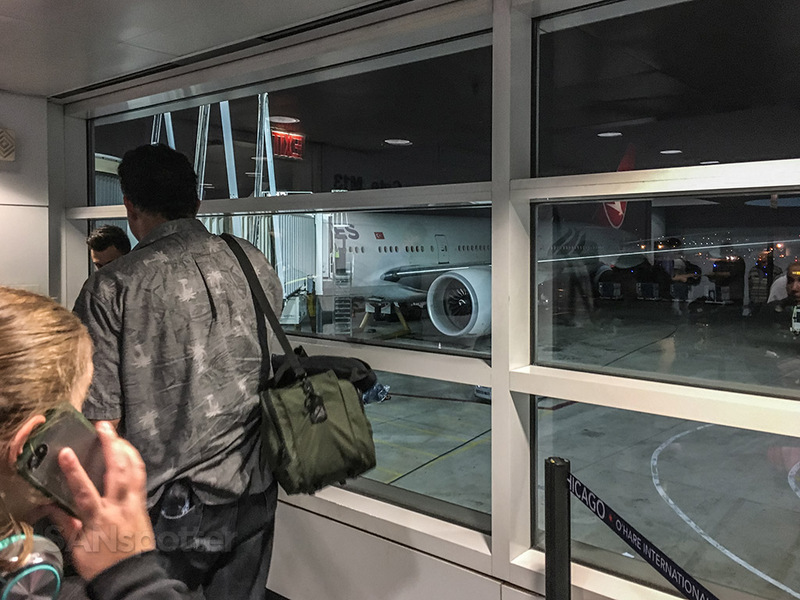 I’m just glad this wasn’t a United Airlines 777. I didn’t fly all this way only to see stuff from back home! 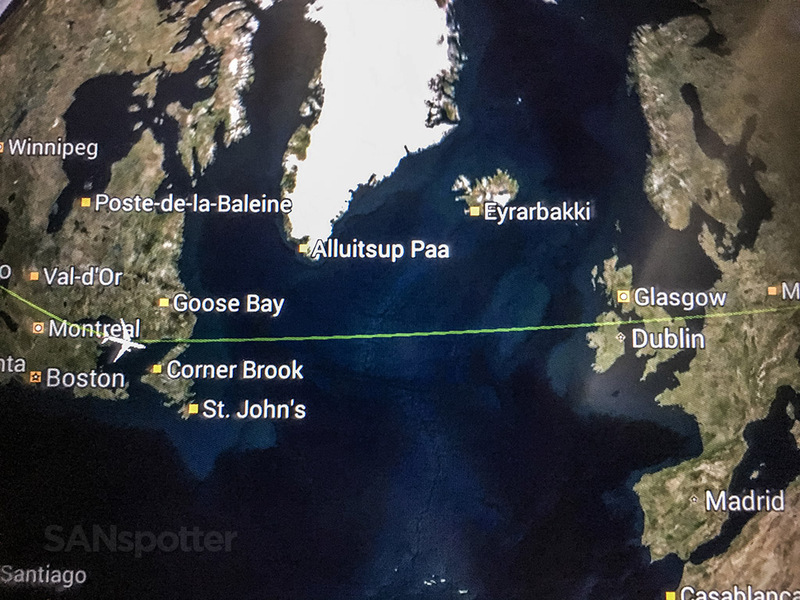 Walking off the plane now, feeling like that was one of the best trans-Atlantic flights that I’ve ever had. 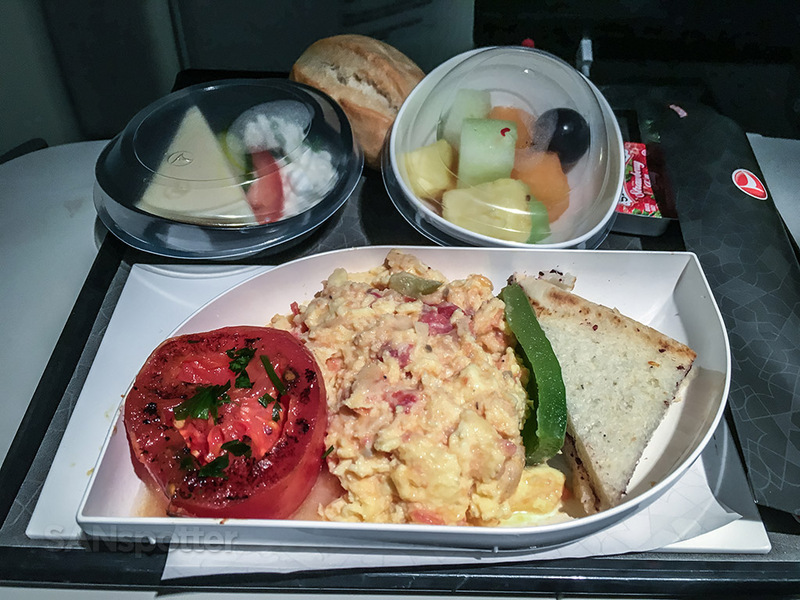 Yeah the eggs were horrifyingly cold, service was slow, and I didn’t even have a window – but the really friendly crew and a highly comfortable seat more than made up for the shortcomings. There I go taking pictures of everything again. Considering that punishment for being a suspected terrorist in this country would likely land me in Turkish prison with no chance of parole, it was probably in my best interest to behave and put the camera away.